Atomic Hawx Ultra 110 W is the stiffest women's ski boot in the new lightweight Hawx Ultra range, bringing the legendary Hawx feel to female skiers with narrower feet. It includes Memory Fit for the personalization of a custom ski boot in minutes, plus a Memory Fit 3D Gold liner with pre-shaped heel and ankle areas for an even better first fit. It also has 3M™ Thinsulate™ insulation for extra comfort. 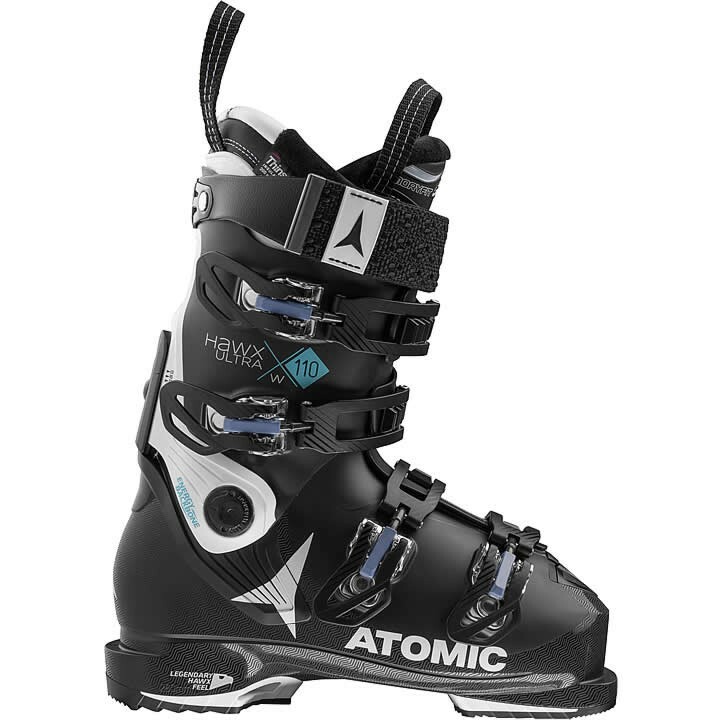 But most importantly, it's the lightest alpine ski boot Atomic has ever made! The reason: a Grilamid cuff combined with the radical new Progressive Shell that adds reinforcement in key zones but reduces wall thickness overall to cut weight by 25%. For the best combination of snow-feel and power ever felt in an all-mountain boot, Hawx Ultra also features an asymmetric Energy Backbone that provides extra strength and edge grip for super strong skiing. Add Power Shift, Cuff Alignment, and the new Cantable Grip Pads and you've got one of the best performing, most customizable boots to date. Memory Fit 3D Gold: Memory Fit 3D is Atomic's new liner featuring pre-shaped thermoformable heel, ankle, and forefoot areas, which creates a snug anatomical fit around the heel and ankle for a better foot hold. So there are no pressure points when you put the boot on for the first time. Then for continuous comfort Atomic gave the liner a 1-piece toe box that precisely follows the shape of the shell and surrounds the foot with comfortable foam. Grilamid Cuff: Grilamid is a transparent polymer in granulate form, which combines a variety of excellent properties. Grilamid is such that specific property requirements can be achieved through modification of the material. A noble polymer with unlimited possibilities. Progressive Shell: Hawx Ultra features Atomic's Progressive Shell, a revolutionary construction with optimized wall thicknesses. The shell walls are thicker in key zones where they need to be strong, then slim everywhere else. This makes the boot 25% lighter, and yet more stable, than other constructions. The best combination of snow-feel and power ever felt in an all-mountain boot. Power Shift: You can adjust your forward lean and alter your flex index +10 flex points. Energy Backbone: The Energy Backbone is a reinforced, asymmetric backbone on Atomic's new Hawx Ultra, providing extra strength for powerful skiing plus enhanced lateral energy transmission for better edge grip. Sidas footbeds offer the best blend of initial cushioning and support.